A startling change in Aunt Polly’s and Pollyanna’s circumstances require Pollyanna to come up with a workable solution. Pollyanna’s solution brings all her new friends from Boston and her old friends in Beldingsville together. Pollyanna also discovers she has to make a choice. Who will win her heart? . . .Had not the man said that this was a public park, and that she had as good a right as anybody to be there? She walked nearer to the pond and crossed the bridge to the starting-place of the little boats. For some time she watched the children happily, keeping a particularly sharp lookout for the possible black curls of Susie Smith. She would have liked to take a ride in the pretty boats, herself, but the sign said "Five cents" a trip, and she did not have any money with her. She smiled hopefully into the faces of several women, and twice she spoke tentatively. But no one spoke first to her, and those whom she addressed eyed her coldly, and made scant response. 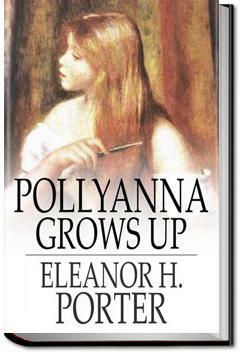 An entertaining sequel to 'Pollyanna', full of characters from the first book, including Aunt Polly, John Pendleton and Jimmy Bean, who is now Jimmy Pendleton. Pollyanna shown in ''Pollyanna Grows Up'', isn't the same as the one shown in the first book. She really got my nerves on. A wonderful follow-up to the first book! Another great Porter book and a fabulous sequel. I just love all of these characters! Padahal saya belum baca Pollyanna buku pertama, tapi "permainan sukacita"-nya udah langsung tertanam di diri saya.